Definition at line 47 of file llchatbar.h. Definition at line 99 of file llchatbar.cpp. Definition at line 111 of file llchatbar.cpp. References LLUICtrlFactory::buildPanel(), LLPanel::childDisplayNotFound(), LLControlGroup::getBOOL(), gSavedSettings, gUICtrlFactory, layout(), LLView::mIsFocusRoot, LLPanel::setBackgroundOpaque(), LLPanel::setBackgroundVisible(), LLUICtrl::setIsChrome(), LLView::setRect(), setVisible(), and TRUE. Definition at line 145 of file llchatbar.cpp. Definition at line 421 of file llchatbar.cpp. References LLLineEditor::getText(), mInputEditor, and LLStringBase< char >::null. Definition at line 203 of file llchatbar.cpp. References CHAT_TYPE_NORMAL, CHAT_TYPE_SHOUT, FALSE, gChatBar, LLView::getEnabled(), LLView::getVisible(), KEY_ESCAPE, KEY_RETURN, MASK_CONTROL, MASK_NONE, sendChat(), stopChat(), and TRUE. Definition at line 416 of file llchatbar.cpp. 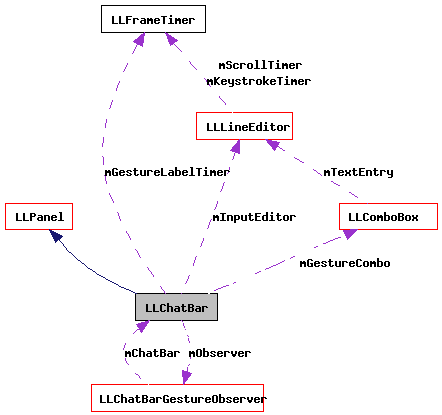 Referenced by LLViewerWindow::handleKey(), and start_chat(). Definition at line 244 of file llchatbar.cpp. References BTN_HEIGHT, LLPanel::childGetRect(), LLPanel::childSetRect(), count, LLRectBase< Type >::getWidth(), llfloor(), llround(), lltrunc(), mDynamicLayout, mInputEditor, LLView::mRect, r, LLLineEditor::reshape(), S32, LLLineEditor::setRect(), TRUE, x, and y.
Referenced by LLChatBar(), and reshape(). Definition at line 714 of file llchatbar.cpp. Definition at line 721 of file llchatbar.cpp. Definition at line 751 of file llchatbar.cpp. References LLSD::asString(), CHAT_TYPE_NORMAL, FALSE, LLCtrlSelectionInterface::getFirstSelectedIndex(), LLCtrlSelectionInterface::getSimpleSelectedValue(), gGestureManager, NULL, S32, LLGestureManager::triggerAndReviseString(), and utf8str_trim(). Definition at line 701 of file llchatbar.cpp. Definition at line 708 of file llchatbar.cpp. Definition at line 597 of file llchatbar.cpp. References _PREHASH_AgentData, _PREHASH_AgentID, _PREHASH_ChatData, _PREHASH_ChatFromViewer, _PREHASH_Message, _PREHASH_SessionID, _PREHASH_Type, CHAT_TYPE_WHISPER, LLKeyboard::currentKey(), gAgent, LLAgent::getID(), LLControlGroup::getS32(), LLAgent::getSessionID(), gGestureManager, gKeyboard, gMessageSystem, gSavedPerAccountSettings, KEY_BACKSPACE, KEY_DELETE, KEY_RETURN, KEY_SPECIAL, LLGestureManager::matchPrefix(), LLMessageSystem::newMessageFast(), S32, LLAgent::sendReliableMessage(), LLAgent::startTyping(), LLAgent::stopTyping(), LLStringBase< T >::trimHead(), and wstring_to_utf8str(). Definition at line 152 of file llchatbar.cpp. References LLPanel::childSetAction(), FALSE, LLPanel::getChildByName(), LLUICtrlFactory::getComboBoxByName(), LLUICtrlFactory::getLineEditorByName(), mInputEditor, mIsBuilt, onClickSay(), onClickShout(), onInputEditorFocusLost(), onInputEditorGainFocus(), onInputEditorKeystroke(), LLUICtrl::setCallbackUserData(), LLLineEditor::setCommitOnFocusLost(), LLPanel::setDefaultBtn(), LLLineEditor::setEnableLineHistory(), LLUICtrl::setFocusLostCallback(), LLUICtrl::setFocusReceivedCallback(), setGestureCombo(), LLLineEditor::setIgnoreTab(), LLLineEditor::setKeystrokeCallback(), LLLineEditor::setMaxTextLength(), LLLineEditor::setPassDelete(), LLLineEditor::setRevertOnEsc(), toggleChatHistory(), and TRUE. Definition at line 293 of file llchatbar.cpp. References AGENT_STATE_TYPING, AGENT_TYPING_TIMEOUT, LLPanel::childSetEnabled(), LLPanel::childSetValue(), gAgent, LLControlGroup::getBOOL(), LLFrameTimer::getElapsedTimeF32(), LLComboBox::getListInterface(), LLAgent::getRenderState(), LLFrameTimer::getStarted(), LLLineEditor::getText(), LLAgent::getTypingTime(), gSavedSettings, LLUIInstanceMgr< LLFloaterChat, LLFloaterChat >::instanceVisible(), mDynamicLayout, mGestureCombo, mGestureLabelTimer, mInputEditor, NULL, LLView::setVisible(), LLFrameTimer::stop(), and LLAgent::stopTyping(). Referenced by LLFloaterChat::draw(), and LLViewerWindow::handlePerFrameHover(). Definition at line 336 of file llchatbar.cpp. References ADD_TOP, LLCtrlListInterface::addSimpleElement(), LLSD::asString(), LLCtrlListInterface::clearRows(), LLComboBox::getListInterface(), LLComboBox::getValue(), gGestureManager, LLGestureManager::mActive, mGestureCombo, NULL, LLCtrlSelectionInterface::selectByValue(), LLCtrlSelectionInterface::selectFirstItem(), LLCtrlListInterface::sortByColumn(), and TRUE. Referenced by LLChatBarGestureObserver::changed(), and setGestureCombo(). Definition at line 193 of file llchatbar.cpp. References layout(), mIsBuilt, and LLView::reshape(). Definition at line 499 of file llchatbar.cpp. References LLPanel::childSetValue(), gAgent, gChatBar, LLControlGroup::getBOOL(), LLLineEditor::getWText(), gGestureManager, gSavedSettings, mInputEditor, LLStringBase< char >::null, S32, sendChatFromViewer(), stopChat(), LLAgent::stopTyping(), stripChannelNumber(), LLGestureManager::triggerAndReviseString(), LLStringBase< T >::trim(), TRUE, utf8str_trim(), and wstring_to_utf8str(). Definition at line 727 of file llchatbar.cpp. Definition at line 732 of file llchatbar.cpp. References gAgent, MAX_STRING, S32, LLAgent::sendChat(), stripChannelNumber(), utf8str_trim(), utf8str_truncate(), and wstring_to_utf8str(). Referenced by LLViewerGesture::doTrigger(), LLGestureManager::runStep(), sendChat(), and sendChatFromViewer(). Definition at line 426 of file llchatbar.cpp. 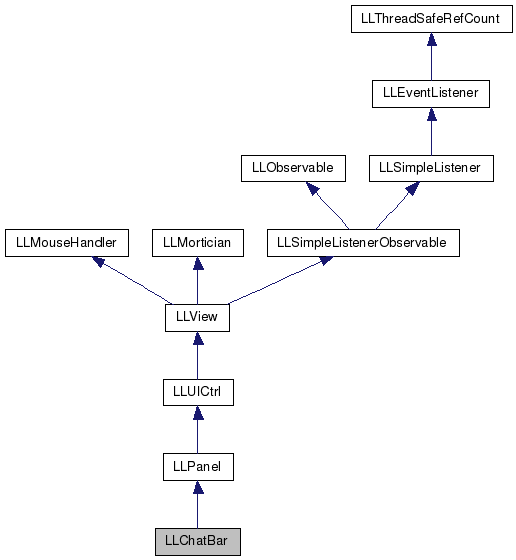 References LLGestureManager::addObserver(), gGestureManager, mGestureCombo, mObserver, onCommitGesture(), refreshGestures(), LLUICtrl::setCallbackUserData(), and LLUICtrl::setCommitCallback(). Referenced by LLFloaterChat::postBuild(), and postBuild(). Definition at line 408 of file llchatbar.cpp. Definition at line 386 of file llchatbar.cpp. References LLFocusMgr::childHasKeyboardFocus(), FALSE, gFocusMgr, mInputEditor, LLPanel::setFocus(), and TRUE. Referenced by startChat(), and stopChat(). Definition at line 590 of file llchatbar.cpp. References gSavedSettings, LLControlGroup::setBOOL(), and LLView::setVisible(). Referenced by LLChatBar(), startChat(), and stopChat(). Definition at line 552 of file llchatbar.cpp. References gChatBar, gSavedSettings, mInputEditor, LLControlGroup::setBOOL(), LLLineEditor::setCursorToEnd(), setKeyboardFocus(), LLLineEditor::setText(), setVisible(), and TRUE. Referenced by handle_chat(), handle_slash_key(), LLViewerWindow::handlePerFrameHover(), and start_chat(). Definition at line 572 of file llchatbar.cpp. References FALSE, gAgent, gChatBar, gKeyboard, LLKeyboard::resetKeys(), LLKeyboard::resetMaskKeys(), setKeyboardFocus(), setVisible(), and LLAgent::stopTyping(). Referenced by handle_chat(), handleKeyHere(), and sendChat(). Definition at line 449 of file llchatbar.cpp. References c, LLStringOps::isDigit(), mLastSpecialChatChannel, NULL, S32, and wstring_to_utf8str(). Referenced by sendChat(), and sendChatFromViewer(). Definition at line 116 of file llchatbar.h. Referenced by layout(), and refresh(). Definition at line 117 of file llchatbar.h. Referenced by refresh(), refreshGestures(), and setGestureCombo(). Definition at line 110 of file llchatbar.h. Definition at line 108 of file llchatbar.h. Referenced by getCurrentChat(), inputEditorHasFocus(), layout(), postBuild(), refresh(), sendChat(), setIgnoreArrowKeys(), setKeyboardFocus(), and startChat(). Definition at line 115 of file llchatbar.h. Referenced by postBuild(), and reshape(). Definition at line 113 of file llchatbar.h. Definition at line 119 of file llchatbar.h. Referenced by setGestureCombo(), and ~LLChatBar().